Back in 2009, it was the beginning of a new era for Star Trek fans (Trekkies) as director J.J. Abrams rebooted the long running science fiction franchise with the movie simply known as Star Trek. This film (the first of the “rebooted” series) took the Star Trek yarn in a different direction, presenting an alternative timeline that showcased a more youthful representation of its characters (Kirk, Spock, McCoy, Sulu, Uhura, etc.) as while as infusing more action-oriented scenes into tale. As a film, Star Trek was met with success and acclaim for majority of its viewers, receiving high scores from critics and much by praise from its fan base as well as casual moviegoers. In 2012, Abrams continued the adventure with the movie Star Trek Into Darkness. Unfortunately, while the movie itself was tried and true summer blockbuster flick, Into Darkness was met with mixed reviews from reviewers and moviegoers. Now, after a four-year gap since the last movie, Paramount Pictures and a new director (Justin Lin) brings viewers back to USS Enterprise with the latest sci-fi-adventure Star Trek Beyond. With a new director at the helm and mixed reviews on the last installment, does this movie exceed expectations in exploring space’s “final frontier” or is it a bombastic and bloated sequel that neither “Trekkies” will like? It’s been three years in his five-year mission as the captain of the USS Enterprise, James T. Kirk (Chris Pine) is feeling the daily grind / monotony of his extensive deep space, voyage, contemplating an exit strategy for a more purposeful career position. Additionally, Spock (Zachary Quinto), the Enterprise’s First Commanding Officer, receives dire news as the Vulcan also begins to think about exiting his life in the Starfleet’s service. Unfortunately, both personally plans are placed out on hold as Starfleet picks up the lone escapee of a remote alien skirmish, sending the Enterprise and her crew into an unknown Nebula territory to save lives. When the mission is revealed to be a trap, orchestrated by the ruthless being known as Krall (Idris Elba), who seeks an artifact Starfleet has taken, the Enterprise is forcibly destroyed by the alien’s devastating swarm-like maneuvers and weaponry. Fleeing the downed the ship, Kirk and Spock, along with other crew members, including Bones (Karl Urban), Uhura (Zoe Saldana), Scotty (Simon Pegg), Sulu (John Cho), and Chekov (Anton Yelchin) are separated in the chaos, crash landing on a nearby foreign planet, inhabited by a collection of Krall’s prisoners. Within time, the group comes together, aided by the female warrior Jaylah (Sofia Boutella), as the crew of the Enterprise plans their escape, determined to unravel Krall’s ultimate endgame in the process. In all honest truth, I’m more of a Star Wars fan than a Star Trek fan. I know…that’s kind of like a taboo thing to say in Star Trek movie review, but it’s the truth. On the other hand, Star Trek (as a franchise) is pretty good and does have some great reason for its overall likeable within its fan base. I do remember seeing 2009’s Star Trek when it came out in theaters and was super excited after seeing it. I love that movie and still do. This played a big part when I saw its intended sequel (Star Trek Into Darkness) and, like most, felt a bit deflated, especially since they let the “cat out of the bag” on the main villain prior to the film’s theatrical release, which was my big pet peeve for the feature. Thus, my expectations for this third installment (Star Trek Beyond) were of mixed thoughts. The first movie trailer (the teaser trailer) for this newest movie didn’t do anything for me (kind of disappointed with it), but the second one (the theatrical trailer) was ten times better and definitely peaked my interest for seeing this movie. So what did I think of it? Short answer…. Star Trek Beyond, while having some problems, is good summer popcorn blockbuster that will entertain many. It’s not the best in this “rebooted” franchise, but its stand in the middle between 2009’s Star Trek and Star Trek Into Darkness. With director J.J Abrams, the director of the first two Star Trek movies of this alternative timeline, stepping down from directing (due to directing Star Wars: The Force Awakens), directorial duties for Star Trek Beyond are placed in the hands of director Justin Lin. Lin, most famous for directing several entries in the Fast and the Furious movie franchise, definitely had plenty of skeptics about directing the third Star Trek installment, but (surprisingly) it’s a great fit. Naturally, there are some differences that a viewer might pick up between Abrams’s style versus Lin’s style, but, for the most part, it’s marriage of the two. Of course, much like his work on the Fast and the Furious movies, Lin knows hold to handle action scenes and the ones in Beyond are great, full of energy, fast paced thrills, and are probably are the biggest sequences of the three films (so far at least). And yet, while sci-fi thrills are bountiful in Beyond, Lin does interject scenes with substance / character development to further pace the movie and drive the narration forward in a meaningful way. Beyond’s script is handed by Doug Jung and actor Simon Pegg and do certainly help Lin out in that regard, with the story moving a brisk pace and to help juggle action scenes and character moments. Personally, the most interesting thing that Jung and Pegg do in the script is the paring of several characters together throughout the movie (Bones and Spock, Scotty and Jaylah, Kirk and Chekov, etc.). These scenes are particular interesting and some are downright funny, especially Bones and Spock, offering up a great sense of character interactions that aren’t typical paired together. This, along with the solid cast (more on that below) helps these combination work well. In conjunction with that, Beyond also is probably, in my opinion, one of the most humorous installments of three films. Sure, the stakes are high and an unimaginable threat is looming, but there’s plenty of fun adventurous ours humor at work throughout the course of the movie, which leads into my next discussion. As a whole, Beyond feels much like the Star Trek of old. While Abram’s two films explored the introductions to the characters (as well as the Enterprise herself), Lin’s Beyond feels like its harkening back to previous Trek installments, with its characters journeying into the unknown, discovering a new planet, encountering new foreign foes, etc. It’s a bit more of joyous sci-fi fun. Aesthetically, it’s a bit more joyous sci-fi fun as if Lin is honoring the franchise’s legacy and, to me, it’s a great way to do that. There are some problems that I have with Beyond (some I’ll detail below), but, for the most part, my main problem is that it’s a pretty straightforward narrative. Yes, I did say that it feels like an old Star Trek story, but the story’s narrative / plot feels a bit too simplistic as I kind of guessed what was going to happen in the end. What is also notable problem in Beyond is that the movie lacks the heightened drama that Abrams was able to pull off in the other two feature films. In both Star Trek and Star Trek Into Darkness, I was on the edge of my seat in wonderment and excitement at what was going to happen next. With Beyond, however, I wasn’t as it was pretty much a standard experience with me. Maybe I had high expectations to be blown away by this movie, but captivating dramatic moments are in a bit of short supplies in Beyond. Lastily, the film’s opening sequence definitely doesn’t have that thrilling explosion that immediately grabs a viewer’s attention as it did in Abrams’s two movies. In terms of moviemaking, Beyond is a tried and true summer blockbuster and is captured beautifully. The film’s visual effects are great, fueling the sci-fi aesthetic of the feature with some impressive shots of CG visuals. Camera angles, cinematography, make-up, costume designs, and even conceptual designs are very pleasing in Beyond and help build on the Star Trek cinematic universe in terms of appeal and futuristic look. Lastly, music composer Michael Giacchino, who previously did the other two Star Trek films, returns to compose Beyond’s score. Giacchino doesn’t miss a “beat”, continuing to create some great music for the feature, including the recurring theme song of these three films. Once again, the greatest strength of these recent Star Trek movies lies within its cast, a youthful representation of the classic / iconic characters from Trek’s past. It worked in 2009’s Star Trek, it continued to work Star Trek Into Darkness, and so does continue to work in Star Trek Beyond, with each returning actor firmly established in their respective character roles. 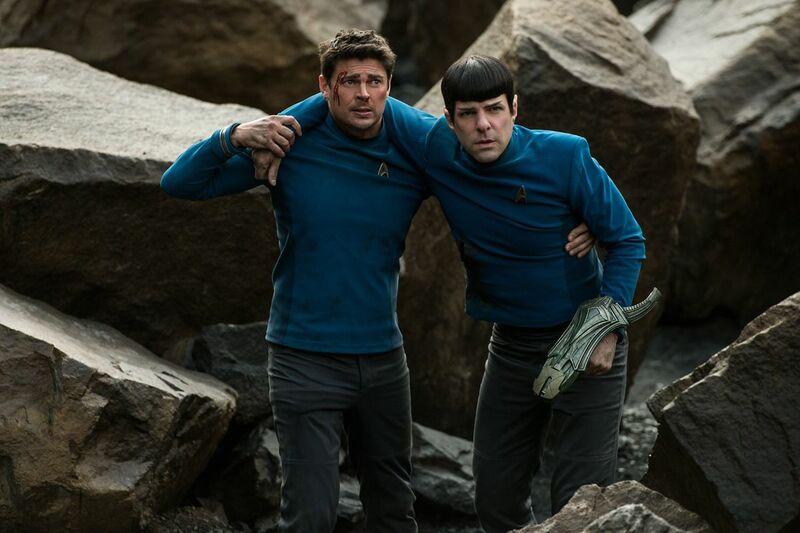 Chris Pine’s Kirk and Zachary Quinto’s Spock again lead the charge, undergoing satisfying story arcs in the movie, though not as strong as in 2009’s Star Trek. Still, both are good character / story arcs that are met with a good payoff (in the end), developing the theme of self-discovery with each. Like Pine and Quinto, Karl Urban’s Dr. Leonard “Bones” McCoy also shines in Beyond, bringing a lot of the film’s comic relief with witty banner. The rest of the crew of the Enterprise, including Simon Pegg’s Montgomery Scott, John Cho’s Hikaru Sulu, Zoe Saldana’s Lieutenant Uhura, and the late Anton Yelchin’s Pavel Chekov, get their moments to shine in several scenes, but, much like the previous movies, are more delegated towards the background and are there for supporting roles of the principal cast. Still, each one excels in their roles and makes up the collective cast of these recent Star Trek films shine immensely. Beyond sees two major character join the principal cast in the movie as actors Idris Elba and Sofia Boutella join the ranks of the Star Trek universe as enemy and ally respectfully. Compared to the other Star Trek villains in this alternative timeline (i.e. Eric Bana’s Nero and Benedict Cumberbatch’s Khan), Idris Elba’s Krall is most physical / intimidating antagonist that the crew of the Enterprise have faced. Elba’s performance in Beyond is good, getting the character’s body movement and voice down to make an imposing figure. Some might argue that Elba’s theatrical talents are wasted beneath heavy prosthetic character, but I didn’t think so. Unfortunately, the same cannot be said in his back-story, which is a mixture of good and bad. If a viewer digs deep enough, there is a poignant dichotomy within Krall’s villainy, which can be extrapolated into the real life. That being said, his whole “reveal” behind his menace isn’t presented until almost the very end, which, at that time, Beyond is basically trying to wrap itself up. Thus, the character of Krall is a bit under developed and, for most part, comes off as your standard bad guy seeking vengeance. While Idris Elba’s Krall may not be the best villain, Sofia Boutella is perhaps the breakout star in Beyond as the female alien warrior Jaylah, who ally to the Enterprise crew. After seeing her performance as Gazelle in the movie Kingsman: The Secret Service, Boutella can definitely handle action scenes and, in Beyond, she certainly does (perhaps even toping that performances in terms of character and action oriented scenes. Beyond her physical scenes, the character of Jaylah also plays a part to the film’s larger narrative and does develop a bonding chemistry with the several members of the Enterprise crew, most notably with Scotty. In short, Boutella’s Jaylah is going to be favorite in Beyond as I for one am hoping to see her return in future installments. (fingers crossed). In smaller supporting roles, but still worth mentioning, are several recognizable faces, including Deep Roy as Keenser (the little creature that’s with Scotty throughout all three of these Star Trek films), Heroes alum Greg Grunberg as Commander Finnegan, and Shohreh Aghdashloo as Commander Pars. As a final note, at the end mid-credit point of the ending credits, the film does acknowledge the two Star Trek actors (Leonard Nimoy and Anton Yelchin) who recently passed away It’s a touching notion, one that may make some fans even tear up at bit. In short, in my own person words…to both actors (Nimoy and Yelchin) and to their respective characters (Spock and Chekov) …thank you…and (as always) living long and prosper (wherever you two are). 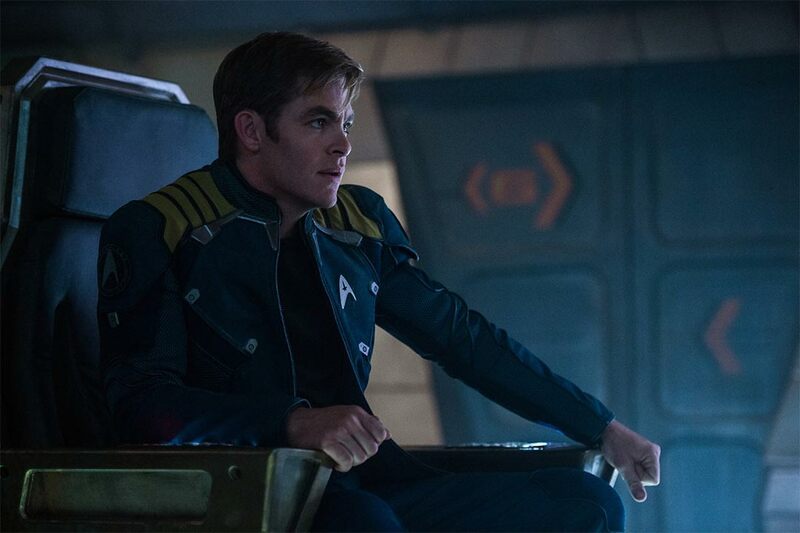 The crew of the USS Enterprise returns to the big screen in the sci-fi flick Star Trek Beyond. Director Justin Lin brings what he has learned from the Fast and the Furious franchise, interjecting action, character moments, and high big movie thrills. Unfortunately, the feature lacks heightened drama of its predecessors that’s combined with standard plot and an ambiguous antagonist. Still, the positives of Beyond outweigh the negatives. Personally, it was a good, solid summer blockbuster that both entertained and satisfied my expectation for the film. Some might balk at the movie for playing it safe, but I would still recommend the movie for pure summer blockbuster escapism. Bottom line…it definitely beat out Into Darkness, but still not as great as the first installment of this alternative cinematic series. Will audiences get to see another installment in the near future? It’s a strong possibility. The series still has enough creative energy / appeal drive and I for one will like to see this continue further…to boldly go where no man (or Star Trek movie) has gone before.